This delicious Weight Watchers Pot Roast recipe makes a lovely main course for any Hanukkah or Christmas dinner. 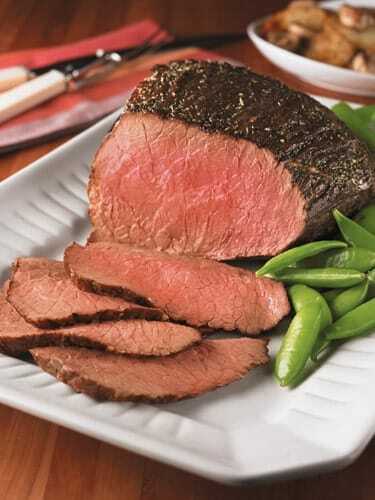 It’s flavorful, soft, tender and juicy, and low in WW Points. You can even turn leftovers into flavorful steak sandwiches or eat some for breakfast with scrambled eggs. The herb crusted coating gives it a lovely aroma and an aesthetic beauty, so it will look gorgeous on your holiday dinner table! Most pot roast recipes can be pretty fattening and high in Points, but the way this one is prepared, all the taste of a traditional, juicy roast beef is maintained, but much of the extra fat and calories have been eliminated. Pair it up with some yummy salads and veggies, or stay tuned into LaaLoosh to get my AWESOME Holiday Mashed Potato Recipe, and serve it up with that. If you are a conscious Weight Watcher looking for an amazing Hanukkah or Christmas pot roast to serve up this holiday, give this delicious holiday roast recipe a try. You’ll be glad you did – and so will your dinner guests! A family favorite, this pot roast is soft, tender, juicy, and a perfect main course for the holidays. The beautiful herb crust delivers amazing flavor and a lingering aroma that will make your mouth water! Preheat oven to 375°F. Season roast with salt and pepper. In a small bowl, combine garlic, mustard, mayonnaise and horseradish. In another small bowl, combine parsley, thyme, dill and 1 tablespoon of mustard mixture. Place meat in a roasting pan; coat top with remaining mustard mixture and cook meat until an instant-read thermometer inserted in center of roast registers 120°F. Coat roast with remaining mustard mixture and press herb mixture onto mustard with your hands. Continue cooking roast until a thermometer inserted in center of meat registers 160°F for medium, or longer until desired degree of done-ness. Cover loosely with foil and then let stand 20 to 30 minutes before carving into 12 thick slices. Has anyone been able to find the nutritional information for this recipe? I was just wondering where i could go to get the nutritional information?? So i could imput it into my fitday?? Thanks in advance for your help! !